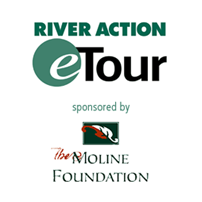 Golf Cart Tour 2018 | River Action, Inc.
Come join the fun on guided golf cart tours on both sides of the Mississippi Riverfront in the Quad Cities area. This is a fun way to see and learn about past, present and future riverfront projects on both sides of the river. All tours are $12.50 per person, with two people per cart. Tours fill up fast, and carts are limited so make your reservations early. Rain or shine! There are no refunds for this event. Tour Alpha - This tour will start at Credit Island and focus on the natural places of the Quad Cities at Nahant Marsh and Carp Lake. Tour Alpha times are 9 a.m. to 11 a.m. and 11:30 a.m. to 1:30 p.m.
Tour #1 - Tour the Davenport and Bettendorf riverfronts starting at Credit Island and traveling to Leach Park and back. Tour #1 is only offered at 2 p.m.
Tour #2 - Tour the Rock Island Arsenal’s beautiful riverfront trail. We will make stops at Col. Davenport House, the 1856 First Bridge pier, the Civil War Confederate prisoner of war camp location, the National Cemetery, the Colonel's Row of Quarters, and finally the historic Quarters One commander's home. Tour times: 9 a.m. to 11 a.m., 11:30 a.m. to 1:30 p.m. and 2 p.m. to 4 p.m.
Tour #3 - Visit Rock Island and Moline riverfronts starting at and returning to Sunset Park, travelling along the Ben Butterworth Parkway. Tour times: 9 a.m. to 11 a.m., 11:30 a.m. to 1:30 p.m. and 2 p.m. to 4 p.m.
Tour #4 - Start and return at the east end of Ben Butterworth Parkway, Moline, and ride through East Moline and Hampton. 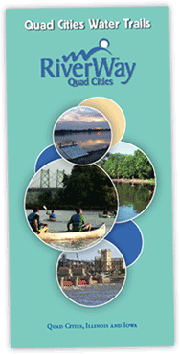 Includes The Quarter, Empire Park, Hampton's Riverfront Park, and historic Black's Store & Museum. Tour times: 9 a.m. to 11 a.m., 11:30 a.m. to 1:30 p.m. and 2 p.m. to 4 p.m.
Tour #5 - This tour begins in Rapids City, Ill., through Port Byron and all the way to Cordova, Ill. and back. Tour times: 9 a.m. to 11 a.m., 11:30 a.m. to 1:30 p.m., 2 p.m. to 4 p.m.
Stay tuned for the opening of registration for the 2019 tours! You can download, print out and complete the mail-in registration, or register online.